The British New Wave band achieved success with no less than ten top 40 singles in the UK between 1983 and 1985. With their wild hair styles (particularly Alannah Currie) and pretty odd fashion sense, they looked almost like a cartoon band that had been brought to life. In terms of both 80s fashion and music, the group certainly left their mark. 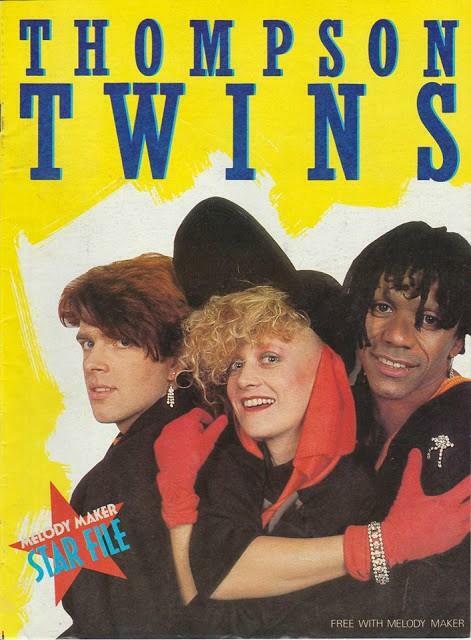 Thompson Twins line-up changed many times, but by 1982 they had been downsized from seven to a trio by their manager, with the other four members paid £500 each and politely told to clear off, although they were allowed take their instruments with them! This left the most familiar line-up of Tom Bailey, Alannah Currie and Joe Leeway. Leeway left in 1986, leaving the duo of Currie and Bailey to make music for around another seven years, although they never achieved another top 40 hit during this time. 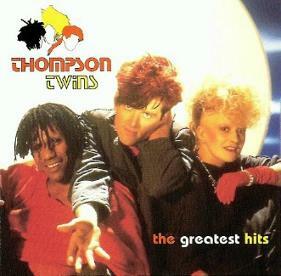 Thompson Twins formed in April 1977 and disbanded in May 1993. The synth-pop band had a string of hits during the mid 80s across the globe. Interestingly, the band was named after the two bumbling detectives in The Adventures of Tintin. The band were often slated by the music press, but this didn't stop them from having three successful albums in the mid eighties. Released in February 1983, Quick Step and Side Kick reached #2 in the UK album charts and achieved Platinum. 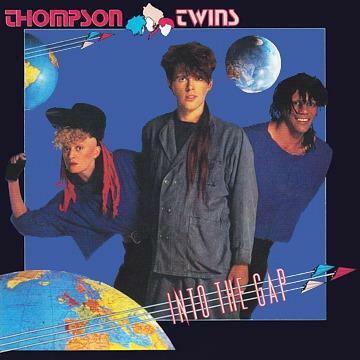 Into The Gap (released Feb 1984) topped the UK charts and achieved 2 x Platinum in both the UK and U.S. and Here's To The Future Days (Sept 1985) reached #5 in the UK achieving Platinum in Canada and Gold in both Britain and America. This third studio album (the second to be released on the Arista Records label) was the first to be released by the band as a trio, and it was also the first bring chart success, reaching #2 in the UK album charts (achieving Platinum sales) and #34 in the U.S. where it was called Side Kicks. Three tracks were released as singles; Love On Your Side (#9 UK, #45 US), We Are Detective (#7 UK) and Watching (#33 UK). The cassette version of the album featured the complete album on side A and extended remixes and B-sides on side B, which made it much more appealing to buy than the LP. 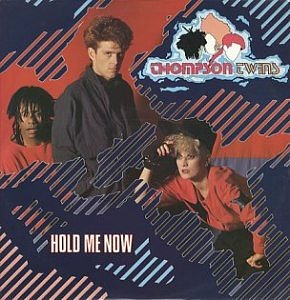 Hold Me Now was the first single to be released from the group's fifth studio album Into The Gap. Released in November 1983, (February 84 in the U.S.) the ballad peaked at #4 in the UK and #3 on the Billboard Hot 100. 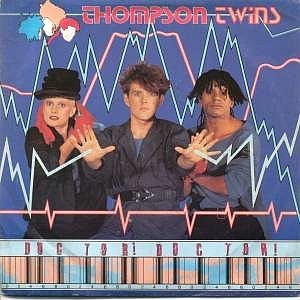 With it's eerie opening, the band's first single of 1984, Doctor! Doctor! reached No.3 in the UK singles chart and was taken from the album Into The Gap. Other hit singles from the album included the previous single Hold Me Now, plus, You Take Me Up and Sister Of Mercy. 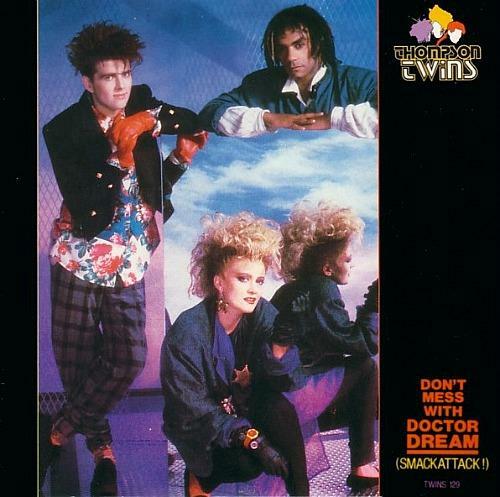 Thompson Twins reached the peak of their musical career with the release of "You Take Me Up", which became the band's highest-charting single reaching #2 in the UK and #44 in the U.S - "Hold Me Now" was the highest-charting single in the U.S. reaching #3. As with the previous two songs featured above, this single was lifted from the group's most successful chart-topping album Into The Gap. It's not hard to see why the album was such a success either. 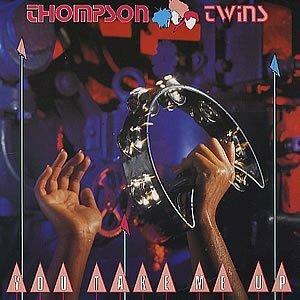 It's packed with well constructed songs (you don't get many of those these days) that make great use of a wide variety of instruments - definitely Thompson Twins best work. A final single from the album, "Sister Of Mercy", reached #11, although in the U.S. "The Gap" was released instead, but it only reached #69 in the Billboard Hot 100. 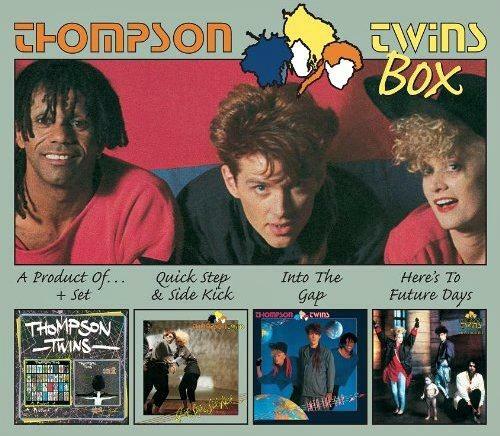 Thompson Twins fifth album was released in September 1985, reaching #5 in the UK and #20 in the US. The first single (produced by Alex Sadkin) was released well in advance of the album's release, as during recording, band member Tom Bailey became ill with nervous exhaustion and the entire project was put on hold. After Bailey recovered, much of the material produced with Alex Sadkin was scrapped and Nile Rodgers was brought in as the new producer. The electronic sound of the previous two albums was replaced with a more guitar-orientated sound. However, the album only acheived Gold, which meant it was not as commercially successful as the previous two albums which had achieved Platinum sales here in the British Isles. Singles; Lay Your Hands On Me (#13 UK, #6 U.S.), Don't Mess With Doctor Dream (#15 UK) and King For A Day (#22 UK, #8 U.S.). Sadly, further album and single releases from Thompson Twins failed to break into the British Top 40.